Grand Canyon Rafting Was A Once In A Lifetime Experience And Something I Always Wanted To Do, Doing It With Sons And Sons In Law Was Extra Special. This Grand Canyon rafting trip was all I hoped for and more. Just a great trip. 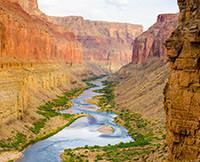 My photos of the Colorado River through the Grand Canyon are all posted and everyone is a favorite one.